Let's Create an Affordable Solution for Growing Your Business Online TOGETHER! Identity Boost offer a range of affordable website design & development solutions and services for growing your business online. Identity Boost are located in Perth, Western Australia. Identity Boost recognise that no two businesses are alike, so when we put together a solution for a client we don't attempt to pidgeon hole the client into a 'one size fits all' solution. We sit down with the client, examine their needs and objectives then formulate an affordably priced solution. The Identity Boost team pride themselves on delivering attractive, well designed websites, that are intuitive and well structured. Our areas of core competency are the development of Content Management System (CMS) website solutions and eCommerce shopping cart website solutions. Identity Boost also offer custom web based application development solutions. The prevalence of eCommerce shopping cart web sites have exploded on the Web in the past few years. There are literally millions of different e-commerce web sites. An eCommerce shopping cart website provides business with an extra avenue to sell their products and services. In fact many businesses are moving away from the traditional bricks and mortar store front and using the internet as a more cost effective alternative to sell to their client base. The eCommerce website also enables businesses to easily extend their client base out of their traditional geographical boundaries and sell to the world. In the fast moving pace of business today it is essential that you have the flexibility to communicate your businesses ever changing product and services at a moments notice to stay ahead of your competitors. Your business website is now considered to be one of the most important mediums to communicate with new or existing customers. In the past the flexibility to manage or change the content of your website has required the services of a Web Designer or Web Developer, which is often an expensive option which might take some time for the changes to be applied. 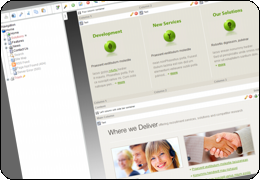 The Kovi Collections eCommerce website went live on the 1st December 2010. Kovi Collections is an online Fashion store catering for a range of fashionable products including dresses, pants, skirts, tops, shoes and fashion accessories. The Kovi Collections website is designed to enable women to identify with their own body shape and select full outfits that are best suited to their shape. 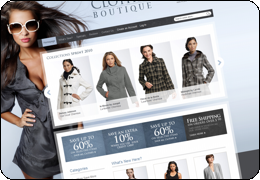 Identity Boost is proud to present the Pocket Diva eCommerce website. Pocket Diva is an online fashion store that focusses on providing clothing suitable for the more petite woman (under 160cm tall). "Identity Boost were able to deconstruct our general requirements to create an easily understood detailed scope of works within our budget. They have provided and continue to provide, timely responses to our often flexible timeframes and this combined with a high level of customer service has proven Identity Boost to be dependable and always able to go the extra distance."